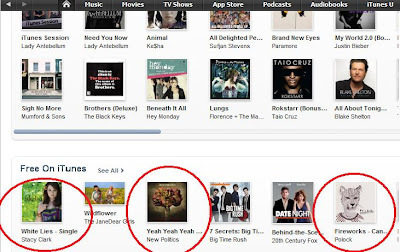 iTunes has some great free singles this week. I check the bottom of iTunes' home page for their 3 free singles often. What's better than free music?! Many times these songs/artists are on their way "up" and become more popular after the iTunes release so you can catch great songs for FREE before the artists are big and the singles cost more money. Stacy Clark White Lies: Her sound really reminds me of Sara Bareilles or Erin McCarley. I love her vocal style and the song is very catchy. This one is my fav of the week! Finds like this make me more eager to check the free singles on a more regular basis. New Politics Yeah Yeah Yeah: This high energy song makes me think of Green Day. The song sounds familiar too, I think I've heard it. It's not as much my style (and on my last play, I heard some choice words I'm not a fan of). I may end up disposing of this one; but it's there if you like it! Polock Fireworks: This one is a bit more laid back than the last one and it seems this band has more of a vintage/folk style. For free, I'll take it! The great part of the free downloads is if I get sick of it, decide I no longer like one, or if I realize what they're saying, then no longer like it ;), they can easily be deleted. Free entertainment is always a great option in my book; enjoy!